OK...so I know I say this all time. But seriously...where is the time going this month? Only 2 more weeks until THE BIG DAY?! I, for one, am not done shopping...for most of the people on my list. I am done, however, for one of the most important people - my husband. In fact, I'm giving my husband the same thing I gave him for Christmas last year. 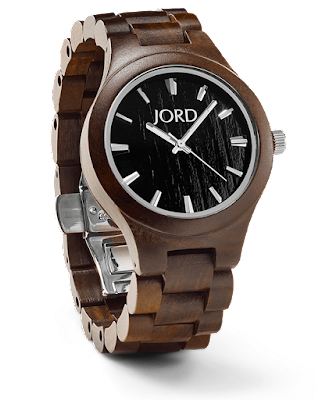 A wood watch from JORD. 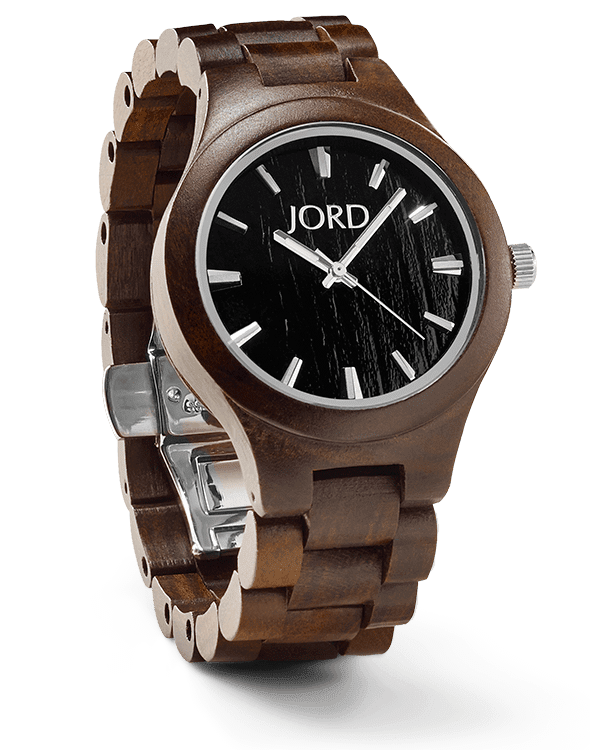 He loves watches...and he's starting to curate quite the collection...PLUS he's a woodworker, so a watch from JORD is really the perfect gift for him. ...the Dark Sandalwood is so beautiful...and he gets a ton of compliments every time he wears it. I LOVE that dark Ash face with the more natural-colored Koa band. So simple & beautiful...and so masculine. Don't get me wrong, though! JORD watches are not just for watch-loving, wood-working men! I have a JORD watch, too, and it is one of my favorite pieces of jewelry. JORD has everyone on your shopping list covered with their huge selection and FANTASTIC prices! AND...(and this is the best part)...JORD has begun engraving both its watches and the presentation boxes they arrive in! WHAT?! I know! It's so awesome! So now the perfect gift can be customized to be perfectly unique! And, really, who doesn't want an engraved gift?! I chose to have my watch engraved with our wedding date...and I love the way it turned out. I'm so excited to give this to my husband on Christmas. I just know he will love it. And it's all the more special now because it's been engraved especially for him. NOW!!! How would you like a $25 INSTANT gift code to use on the JORD site so that you can order the perfect gift for someone you love? ENTER YOUR EMAIL ADDRESS - and you will instantly receive a code in your inbox that you can spend on any watch or service on the site! The JORD website is truly exceptional. It's easy to navigate and each watch is described wonderfully with beautiful close-up photographs so you can really see its detail. There is even a live chat available if you have any questions at all while you are choosing your watch. Need an idea of how each watch looks on? Well, JORD has that covered! You can shop the @woodwatches Instagram feed! It's really so cool...click on the "shop Instagram posts" link and you will be taken to a gallery of photos taken by real people wearing their wood watches! See one you like, click the photo and you'll be taken to the watch listing on the site. It makes choosing a watch you like so easy! Plus, it's just really cool to see how everyone wears their watches...(smile). JORD can engrave the back plate of the following series: Fieldcrest, Reece, Frankie35, Frankie and Conway. The cost of engraving is $35 and you can choose block or script engraving. JORD can engrave the side of the cedar wood presentation box that the watch comes in. The cost of engraving is $45 and you can choose block or script engraving. Don't delay! Christmas will be here before you know it and you don't want to let the chance to save a little money get away from you! Enter your email address at the link below and get your $25 gift code! DISCLAIMER: I have been compensated for this post. However, all opinions are mine. I LOVE these watches and owned one long before I was asked to work with JORD. They really are that awesome.